These are the same clocks used in our popular MICRO I timer. The clocks were made to our specifications by a firm we selected in China after a three-year search and evaluation. Some have shown an interest in purchasing the plastic clocks for use in their own projects. I really hate the term Tomy as there is no such clock and never has been. Tomy was a toy maker that used plastic clocks made by other firms in their products. But, it seems to be the generic name for any plastic clock. These have no association with any firm named Tomy. A photo of of the clocks is above. They weigh 3.15 grams as shown. The approximate dimensions are 1 1/16" X 9/16" X 5/16" thick. The shaft protrudes about 3/4" from the body. The initial rotation from fully wound is about 3 seconds for 360 degrees. The clock runs for about 30 seconds from fully wound. The shaft is permanently locked to the spring gear. This means there is no slip clutch. If one should happen to force it after fully wound and break the lock, the clock is junk. Far as I know there is no way to take them apart for repair. For our use, some modifications are made to the clock, but those are not sold. 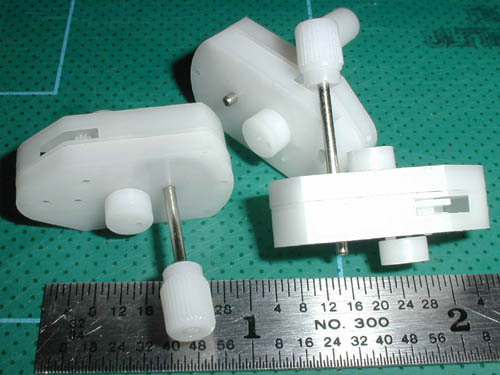 The two small wheels are normally cut off the plastic shaft flush with the case using a razor blade. A number of years ago a fine DT timer was made by a man in Australia that used a plastic clock very much like ours. I have photographed the one I have and you can perhaps get some ideas from this well made timer. It is called a Fletcher DT timer and you can click HERE to see more about it. AS IS these are 6 for $19.50. We offer no technical advise or help and have no specifications other than what is given above. Wind up Plastic Clocks Price: $19.50 for 6 pcs.